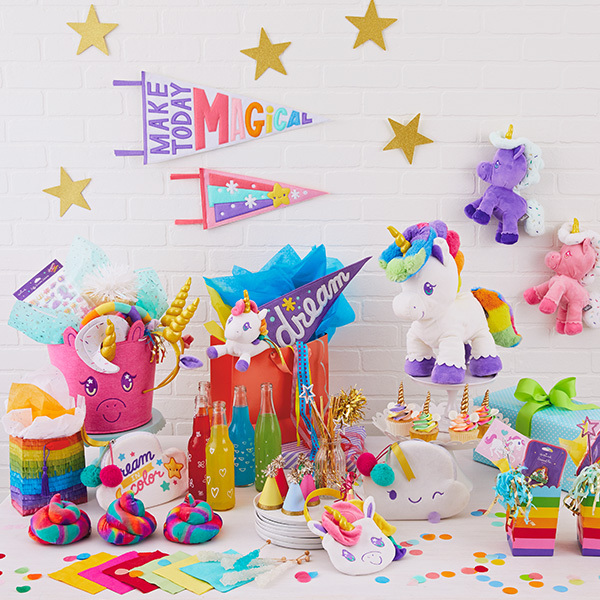 Celebrate your one-of-a-kind kid’s birthday with a bright, cheerful and unique unicorn party. Unicorns are playful and happy and live in a world of sunshine and rainbows—what better theme for young partygoers? And calling someone a “unicorn” means saying they’re a rare, extraordinary creature: Just like your favorite kiddo. Here are some ideas for creating a wonderful party—and sneaking in a few sweet, positive messages. Start with white basics (like a table cloth and plates) so your colors really pop. Rainbow-themed napkins and treat bags are easy to find—or just mix and match colors. Cover the table with giant DIY confetti made with a large hole punch and tissue paper scraps. 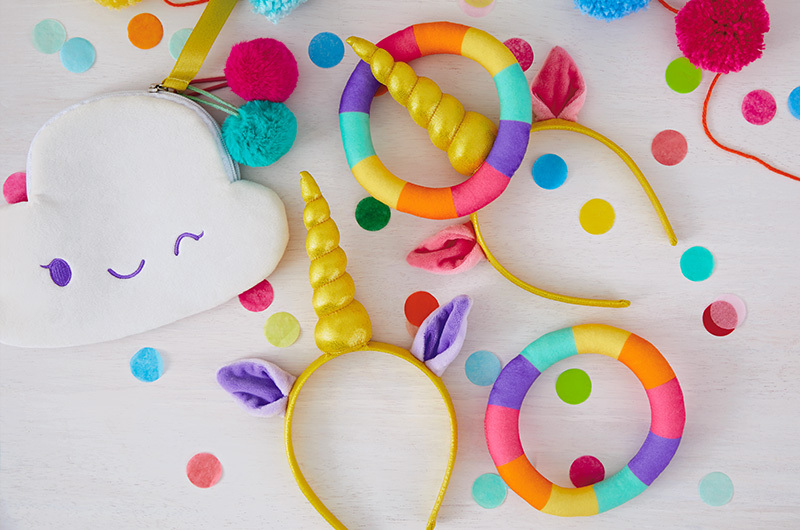 Hang some festive pennants with inspiring messages, stick up a few gold paper stars, make a tissue paper tassel garland, add some balloons—there’s no such thing as over-the-top at a unicorn party. Give your table a centerpiece: try an oversized unicorn stuffed animal, a unicorn cake or a stand filled with unicorn cupcakes, or a wrapped box decorated like a unicorn. Want to keep your little herd of unicorns occupied for a few moments? Take a creativity break with a box of crayons and our free unicorn coloring page. They pick words that describe them and activities they do with their friends from our list and voila! That’s their unicorn name. 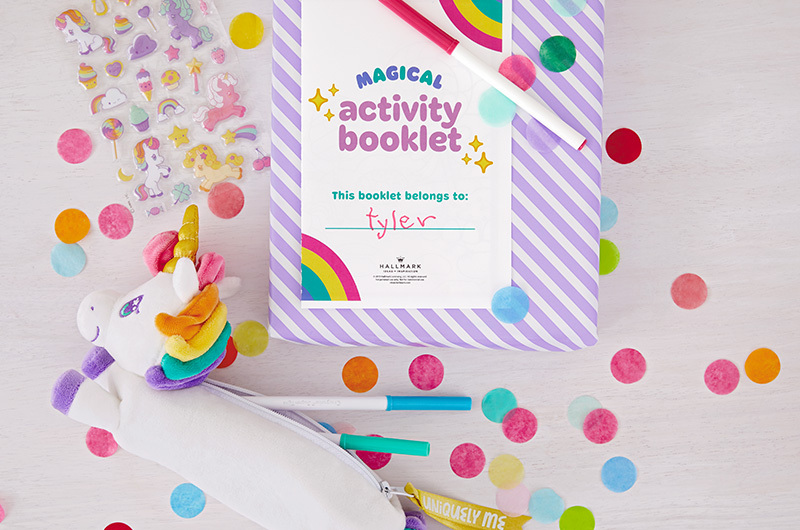 Print our Magical Activity Booklet for each child—it includes the coloring page and the name generator. Place two 5’ pieces of tape or string parallel to each other about 3’ to 5’ feet apart (depending on the age, coordination, and arm-span of your party guests). Split the guests into two groups, and have them line up behind one of the lines. Give the first child in each line a unicorn headband, and the second a rainbow ring. On your “go” signal, the first child moves to stand behind the other line, and the second child tries to the ring onto the horn. (The child with the headband can move around to catch the ring, but can’t cross the line.) Once the ring has been caught, the unicorn hands the headband to the ring-thrower and the ring to the next child in line, and goes to the back of the line. Scoring: Whoever gets through the line first wins. Or count how many catches a team can make in a certain amount of time. This is a great game for cooperation. Ask the kids to make a circle. Two children standing next to each other put on the unicorn headbands, with one ring placed on one of their horns. The player with the ring must pass it to the other player without using their hands—if they drop it, they must pick it back up on their own horn before passing it to the other player. Once the ring has passed, the first child gives their horn to the child on the other side of the player with the ring. See how long it takes to pass the ring all the way around the circle. Two players wear the unicorn headbands—they are unicorns running free. The other players take turns trying to throw the rainbow rings on their horns; whoever can “catch” them with a ring gets to become a unicorn. This is best played outside or in a large open space. 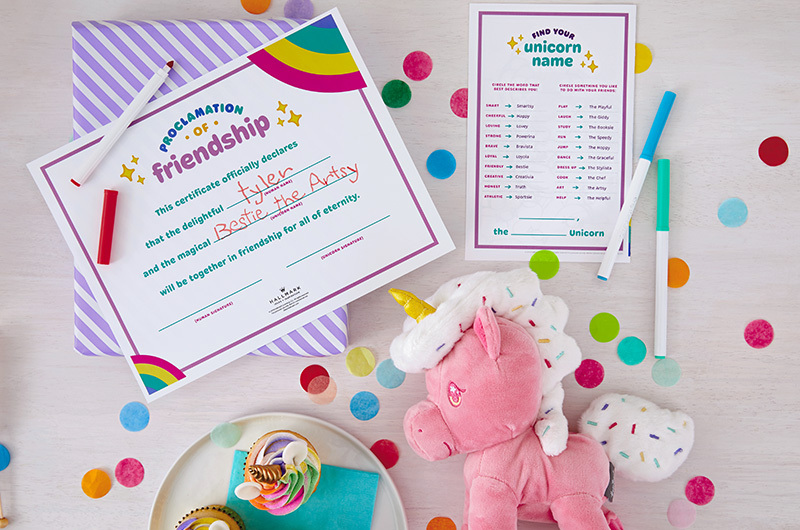 Whether their best unicorn buddy is imaginary, invisible, or stuffed (like one of these), they can pledge their dedication with this cute, displayable Proclamation of Friendship certificate. A unicorn pencil pouch or zipper bag filled with a few colorful markers or crayons and a sheet of stickers makes a great party favor to go with the booklet. Obviously, it’s important to keep your tiny heard of unicorns well nourished. More fun than a field of magical creatures, these unicorn cupcakes are pretty simple to make. 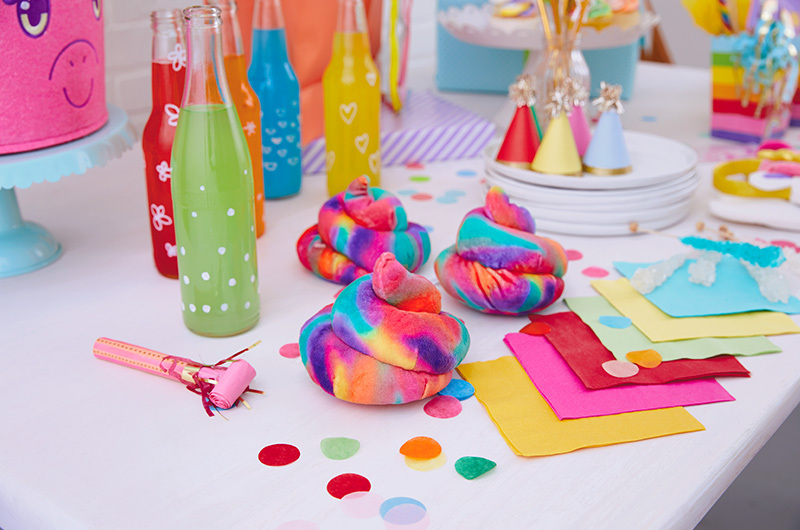 All you need is a pastry bag with a large star tip and some gel food coloring—along with pre-made unicorn horns and ears—to create this magical batch of goodies. Use the linked recipe for classic holiday peppermint meringue cookies, but flavor with strawberry extract instead. For rainbow colors, paint the inside of your pastry bag with stripes of gel food coloring and pipe into poop-emoji style swirls.